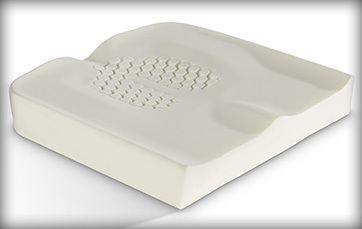 A Skin Protection cushion offering the Axiom Difference design elements with an emphasis on immersion and envelopment, Axiom S is a great entry level skin protection cushion. With a special emphasis on the area that distributes pressure around the tissues that support the bony prominences. Deeper hexagonal shapes allow for increased immersion with better envelopment. 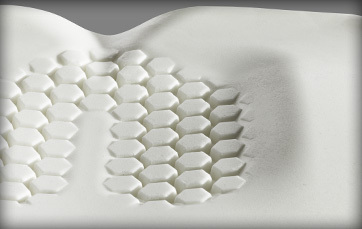 The unique hexagonal foam shapes in the well reduce surface tension and increase envelopment around the ischia and coccyx. By only using one pleated cover, surface tension is reduced, providing better immersion into the well. Cooperating with Georgia Tech to study anthropometrics, Axiom S has a properly designed pre-contoured shape. The appropriately contoured cushion supports the trochanters and femurs while redistributing the load to protect the ischial tuberosities and coccyx. 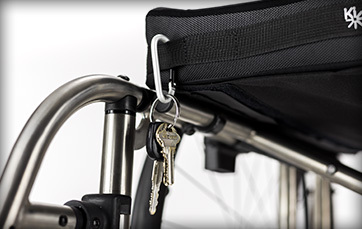 Axiom Ss innovative cover is aesthetically pleasing with functional benefits for both the client and caregiver. A water resistant zipper and loop zipper pull make it simple to don and doff the cover while protecting the foam. There is an easy-to-reach front handle with utility loops for hanging accessories. 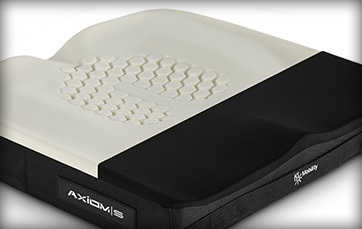 The base of Axiom S is constructed with high-IFD polyurethane foam. The cover is constructed with a 4-way stretch, water-resistant, pleated top layer with a skid-resistant bottom panel, and high denier side panels. 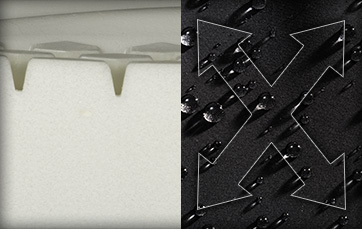 All elements of the material lead to a long-lasting, comfortable and functional product.